If there was a Jedi master of Taj, it would be Ben Sanders, guitarist, vocalist and founder of your favorite ska band. 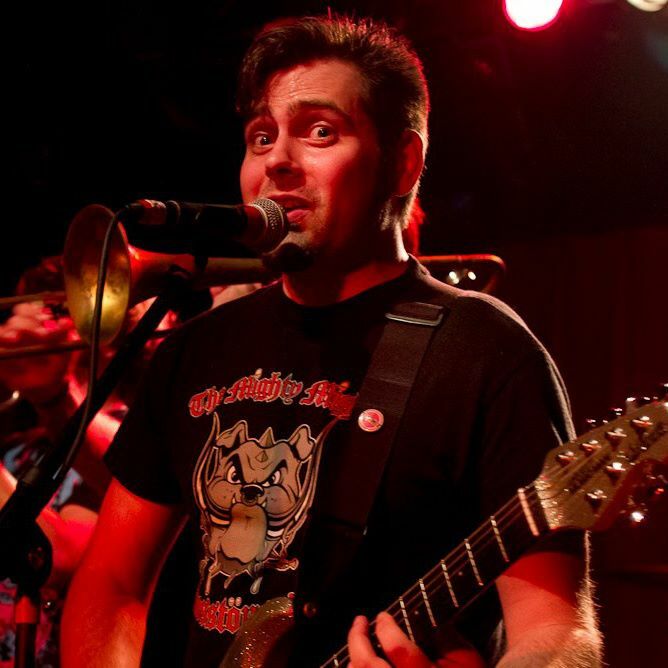 Ben is the only remaining original member of The Taj Motel Trio and has been involved in the Atlanta ska-punk music scene for, well, a long time. I’ve loved music for as long as I can remember. As a child, I was always begging to listen to Fox 97 (the old Atlanta area “oldies” station) and I loved to play air guitar or drums while it was on. My dad took this as a sign that I needed to play a real instrument so he bought me a guitar for Christmas when I was 11 or 12, wrongly assuming that guitar would be quieter than drums. I didn’t really take it seriously until I was in high school and saw Poison perform “Unskinny Bop” on the American Music Awards…C.C. Deville played a ripping solo and threw his guitar over his shoulder, caught it, and kept playing…I knew what I wanted to do after that! How in the hell can anyone only have one favorite song? There are so many songs that I love for various reasons…I can’t choose just one. Currently, I’d have to say it’s Nick Hexum from 311…although the answer to this question changes quite frequently. The Nick Hexum quintet’s album “My Shadow Pages” hits me in the feels every time I listen to it. Seriously, listen to “Super Natural,” “Just Give it to Me,” and “The Dreamer”…you won’t regret it. Also, check out the song he cowrote on the new Goldfinger album. It’s called “Liftoff” and I love it! What do you do in the real world? I’m a full-time dad and I run a screen printing shop with my brother from another mother, Kevin Rose. What’s the craziest thing you’ve ever done but can’t get arrested for? Predictable self-deprecating answer: playing in a ska-punk band for 20 years. Actual answer: I can’t get arrested for it because nobody knows. But trust me. It was crazy. How’d you get involved in the world’s favorite ska-punk band (The Taj Motel Trio)? I was a trumpet player in high school (and college) and wanted to start a band with horns. I didn’t know what ska was even though I’d been listening to Rancid for a while, so we started a band and tried to find a sound. Early on, it was a strange mix of grungy metal pop punk with horns on top. Our first trumpet player described it as “Metallic Fungo-Pop,” I always enjoyed that label. Eventually, we discovered ska, thanks to Reel Big Fish, Less Than Jake, Five Iron Frenzy, The Mighty Mighty Bosstones, The Suicide Machines, Catch 22, etc….I could go on for a while but you get the point. © 2019 The Taj Motel Trio. All Rights Reserved.